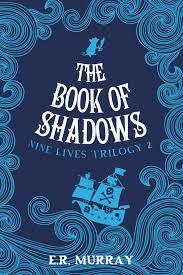 BleachHouseLibrary.ie: Blog Tour: 'The Book Of Shadows' by ER Murray. Review and Q&A. Blog Tour: 'The Book Of Shadows' by ER Murray. Review and Q&A. Thanks to ER Murray for inviting us to take part on her Blog Tour for Book 2 in the Nine Lives Trilogy, The Book of Shadows. Mia was a massive fan of Book 1, The Book of Learning and you can read her review HERE. There is also a great Q&A with Mia and Elizabeth further down this page. This is the eagerly anticipated second part in the Nine Lives Trilogy. It catches up with Ebony Smart two months after the events in the previous book, The Book of Learning. Aunt Ruby introduces Ebony to another family from the Order of Nine Lives, the O'Haras. Within the family are snooty Seamus, who copies his dad's every move, and cheery Chiyoko, Ebony's number one fan. The Book of Learning has been dormant since the last installment but when Chiyoko picks it up, it spells out the message "They're coming". These words start the unveiling of new secrets for Ebony, including the discovery of an anime show based on her life. While in Stephen's Green Ebony stumbles across a silver box and is given the task of returning it to its owner. As mysterious as it already is, things get worse when Chiyoko is taken by strange creatures called Shadow Walkers. Ebony has to figure out what is coming and how to stop it, return the silver box when she has no idea who its owner and also find a way to get Chiyoko back. On the bright side, she has made a few friends (some characters old and new) to stop the oncoming threat. Can Ebony and faithful rat Winston complete their missions? Confusing, right? Even though this all sounds a bit mind-wrecking, it is one of the best books I have read this year. A potential award winner, methinks. There is one thing I can't mention as it could spoil the first book and I wouldn't want to ruin it for anyone. I HATE spoilers! Let's just say it involves a traitor, but one which side? I enjoyed it so much that I had to re-read it. There is a major cliffhanger, so hurry up with book three ER Murray! I want to see what happens next. If you could ride the Shadowlands, what would be the first thing you would do? I’d go to Japan. It’s been my lifelong dream to visit Japan, but for some reason, I haven’t managed it yet, so I would use the Shadowlands to transport myself there immediately. I’d look for some beautiful gardens and feast on a huge plate of sushi and I would be in heaven. That’s if I managed to master the Shadowlands, that is: I imagine that creating them on the page and mastering them are two very different things. Who would you prefer to be real; Mr. O'Hara, Mrs. O'Hara, Seamus or Chiyoko? I love Mrs O’Hara – she’s so mysterious and she has a very calming effect on the people around her. I’d love if she could be brought to life. I’d like to sit next to her and read books and watch her shadow puppet plays. I think she’d be a good person to go and see when you’ve had a bad day – she’s really intuitive and you wouldn’t have to explain anything. She would instinctively know and her naturally gentle aura would make the world feel a nicer place. If you were to have three past selves, what era would each one come from? I’m going to choose eras I’m really, really interested in; Wild West, Celtic and Victorian. They’re all pretty gruesome in their own right, but I’d love to have a poke around and see them in all their glory for myself. What we know about the Celts is pretty limited, but I adore mythology and I’d love to see the Celtic religion and worship in action, how it affected every day life. I’m a huge fan of Westerns, and that rugged landscape, so I’d love to witness the atmosphere at the time; it was a crazy free for all, and truly wild (though I’d rather be a Native American Indian than a cowboy). I’m also fascinated by the morbidity of Victorian times, the strangeness and quirkiness of it all, the contradictions; it’s no surprise that gothic horror arose from this era. But I don’t think I’d like to stick around in any of these eras for too long – they all seemed pretty dangerous! Where did you come up with Shadow Walkers? I’m fascinated by shadows, by how they are simply the result of an object in between light and a surface, and yet they have an eerie and unsettling quality. People always imagine things going bump in the night climbing out of the shadows – it’s like we have a natural instinct or aversion to them, so I thought that would be fun to play with. Shadows are fun to explore. The Shadow Walkers represent our worst nightmares – Ambrose is controlling them but they’re pretty terrifying, and so they’re a worthy foe for Ebony Smart and the Order to deal with. Which would you prefer to have; The Shadowlands mask, the silver box or the soul-swap machine? Masks can be a bit scary – I don’t like looking in the mirror when I have one on – so I’ll leave that one. I like the silver box, and would love to hear the tune, but… at the risk of sounding like a baddie, I’d take the soul-swap machine. That way, if I decided to make myself immortal, I could choose some of my favourite people to bring with me. Who is your favourite character in the Nine Lives Trilogy? I really like Ebony. I think she’s brave and clever, but also flawed. She has a bit of a temper but is really kind and thoughtful and she’s had a tough time but dealt with it pretty well. Many people would buckle under all that pressure but I think she’s shown great courage. I admire her strength of character. Would you choose Seamus, Chiyoko or Winston to be your sidekick? Winston all the way – he’s so loyal and smart and funny. If Ebony didn’t have Winston by her side, I feel like she’d have taken more wrong turns. Rats are such intelligent creatures and also very loving. And seeing as Winston is extra special, you’d definitely want him on your side when you’re trying to solve mysteries and beat curses. Who do you think you're more like, Aunt Ruby or Mrs. O'Hara? I wish I could say Mrs O’Hara, but in reality, I’m more manic and hyperactive, so I’m much more like Aunt Ruby. Dashing around, switching from one project to another, half finishing sentences and butting in other people’s conversations; that sounds a bit like me. Also – and I didn’t think of this before you asked this question – I don’t drive. I actually based her on a friend originally, but my characters are always fusions of many different people, so maybe there’s actually a bit of me that’s sneaked in there too? What is the next book in the Nine Lives Trilogy called? The final piece of the puzzle is called: The Book of Revenge – Nine Lives Trilogy 3. I’m writing it right now! I’m on the third draft and it’s shaping up nicely. I’m looking forward to see where the characters take me. What is your current favourite movie? I love films so it’s really difficult to pick a favourite, but I’ll try... I like quite dark films, so Pan’s Labyrinth and Mirror Mask are still favourites. I loved Where the Wild Things Are and I really like anime like Princess Mononoke, The Wind Rises and Spirited Away. It’s an old film, but Kes is still up there (also a favourite book) – as a child, it really spoke to me. Other than that, I like films set in other cultures, like Rabbit Proof Fence and The Whale Rider. For this age group, I think My Name’s Not Friday by Jon Walter is one of my favourite books of all time and difficult to beat. Knights of The Borrowed Dark by Dave Rudden is an incredible read, and also Gold by Geraldine Mills. I’m excited about The Ghosts of Magnificent Children by Caroline Busher (out in October) and The Ministry of Strange, Unusual and Impossible Things by Paul Gamble is outstanding. We’re so spoiled, aren’t we? Team Captain America or Team Iron Man? Team Iron Man, definitely. I think he’s darker, more broken. He has more depth. I love to love a hero that we shouldn’t love! The Book of Shadows is published by Mercier Press and is available in Paperback and ebook format. You can order your copy via amazon link below. A Book-Lovers Affliction: Pleasurable Pain. Book Review - 'Beneath the Surface' by Jo Spain.